I hope this email finds you in excellent health. I understand that the Holocaust Memorial and Tolerance Center of Nassau County (“HMTC”　https://www.holocaust-nassau.org/ ) in New York has a plan to build the Permanent Exhibition of Comfort Women in cooperation with the Korean American Public Affairs Committee (“KAPAC”　http://kapacusa.org/en ). 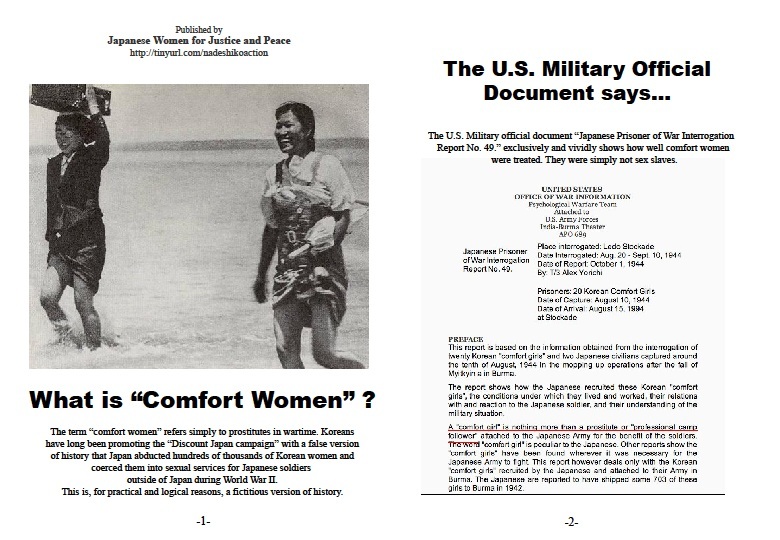 It is important to understand that “comfort women” in question means “prostitutes” for Japanese military people during World War II. 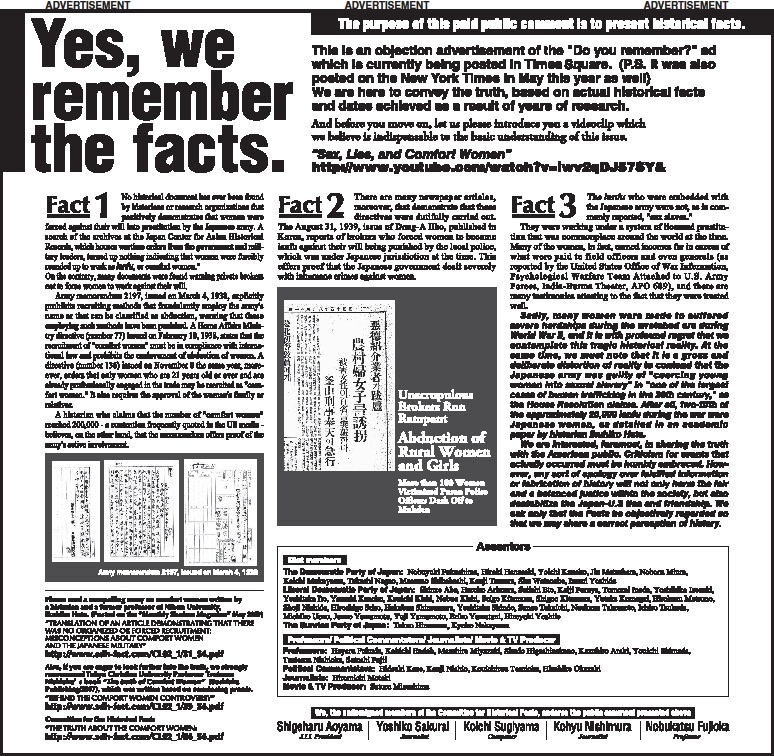 The monuments built in Nassau County, New York, and in Bergen County, New Jersey say “more than 200,000 women and girls who were abducted for the use of sexual slavery by the armed forces of the government of Japan　1930’s – 1945 known as ‘Comfort Women”. These words are not true. 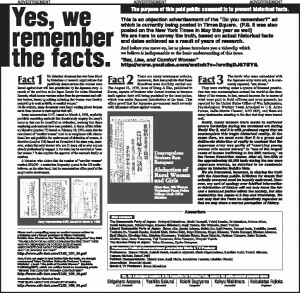 The researches made by the Japanese government and specialists have proved that those comfort women were not abducted by Japanese military people. I know that human trafficking existed during the war time, and it was a social problem. Not only in Japan but also in places in Asia there were women who worked as comfort women for their family members owing to poverty. During the Korean War and the Vietnamese War, there were many such women. 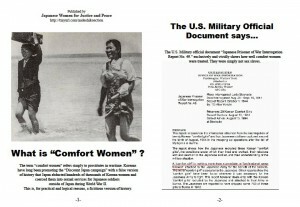 HMTC has targeted only the comfort women for the Japanese military people based on the fabricated stories on them, and is attempting to exhibit phony propaganda displays. HMTC says, “Since 2007, nearly 180,000 students, teachers, employers and law enforcement personnel have participated in the Holocaust Memorial and Tolerance Center’s education programs, including 130,000 students”. It is unbelievable that the respectful HMTC is going to exhibit fabricated stories to give wrong education to many people. I hope that HMTC’s staff check not only materials presented by Koreans but also many other materials as quoted below. *Please read from the 4th page from the last. We Japanese are against the exhibition of comfort women. All Japanese respect HMTC a lot, and believe that HMTC will never ruin your good name by taking wrong action by believing fabricated stories. Welwyn Preserve, 100 Crescent Beach Rd. ◆ Lalezarian Developers , Inc.
military1 7 and educate future generations about these crimes. Korean American Voters' Council]117 .